The Friday Night Co-ed Soccer League atmosphere is designed for casual soccer games. 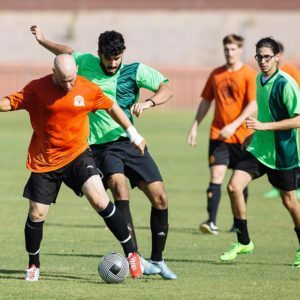 The coed soccer league games aren’t for the next World Cup contender, but if you want a friendly coed soccer playing experience then this is the coed league for you. The league has different levels of play ranging from the casual soccer player to moderate skill of soccer players. We are an adult coed soccer league and do require that participants are 18 years or older. Please remember that coed soccer is a contact sport at times. We do try and limit physical play because the league is casual, yet injuries can happen so we strongly suggest each soccer player to have insurance. You can purchase a short-term policy on your own, the league’s insurance is liability only. Human Beehive FC win Winter 2017 Championship! SMV FC for Winning the Fall 2016 Championship! SMV FC for Winning the Summer 2016 Championship! Arcadia Saints win the Winter 2017 Wooden Spoon! Arcadia Saints win the Fall 2016 Wooden Spoon! Human Beehive FC win the Summer 2016 Wooden Spoon!